Have you ever eaten fresh pea soup? Prior to this latest experiment with my garden produce, I'd only ever had the kind made with dried peas and ham. Good as grandma's dried pea soup was--and, boy, it was good the way she made it--I was intrigued when I read Alice Waters' recipe for a version made with fresh peas (in The Art of Simple Food). I needed to gather about 2 to 3 cups of peas for the recipe. And the exciting part here is that, for the first time in my five years with an edible garden, 2 to 3 cups of shelled peas was a real possibility. At last, I had a good space in which to plant a decent quantity of seeds, and I got them in the ground early. The result? A bunch of now-shoulder-high plants, dripping with pods ready for picking. That's it! 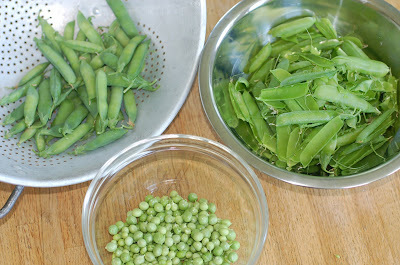 The blanching process locks in the peas' sweet flavor. 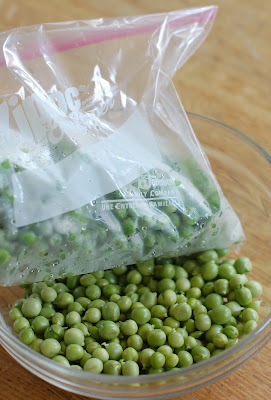 It's a good process to do if you want to store fresh peas for later use. That way, they don't turn starchy and horrible tasting. 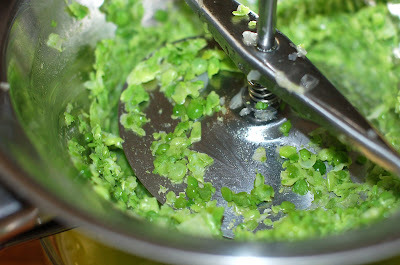 Over the weekend, I picked a second round of peas--about a cup and a half or so--and combined the fresh and frozen batches with onions sauteed in olive oil, salt, and a few cups of water. I put the whole bit through the food mill, and there we had it--the freshest, sweetest, most brilliantly colored pea soup I've ever eaten. WOW that looks amazing, what a great idea. I am bummed that I did not get my peas in earlier this year, but I have a whole row of sugar snap peas. Do you think those would be good for fresh pea soup? Looks delicious. My peas are only just starting to develop pods so a little while to wait yet. That looks so delicious and fresh! My mouth is officially watering. How wonderful that you were able to grow so many peas! That makes me want to go and make some right away! I might even try a chilled pea soup! This looks delicious - I'm def going to give it a go when I can grow enough peas! I've never had fresh pea soup, but I imagine it is amazing and very tasty. I would have been very proud of your yield of peas had it been me. We live in an apartment and currently have a container garden and two community garden plots, we do what we can, but the space doesn't really allow for a large quantity of anything (but I DID make sure to plant plenty of tomatoes and peppers). 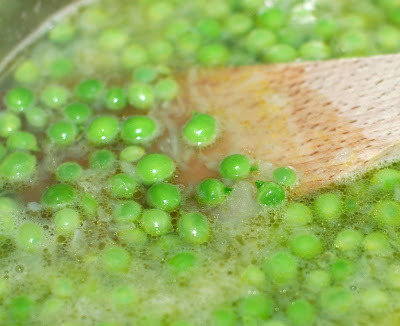 I may have to try making fresh pea soup with farmer's market peas, thanks for the idea! That's great, Christa. I've never had such good luck with peas here in the city and next season I think I'll be switching to sugar snaps. They worked much better for us. 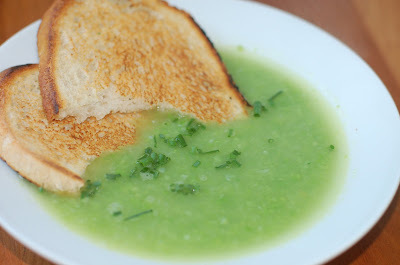 What an wonderful blog, I have never tried fresh pea soup before but it looks so good. Brilliant recipes for peas. I can't wait to give them a go. It's a long time since I've had fresh pea soup, you've got my taste buds watering! Oh yes, this looks delightful! Thanks for sharing. Wow yammm! Pea soup is an interesting recipe. At last I have found something interesting and unique to serve to my guests during the holidays. I am sure that they'll love this pea soup. thank you for shearing your post.